“Recently I decided to revamp my website to make it more mobile and user-friendly. I was delighted to have chosen Curious. Marie and her team designed a modern platform to deliver my ideas and introduce my portfolio. Despite several changes of mind along the way on my part, Marie was very patient and always had a new idea or a solution to propose. I have to admire her patience and compliment her excellent communication skills. The regular updates and progress reports along the way were very much appreciated. 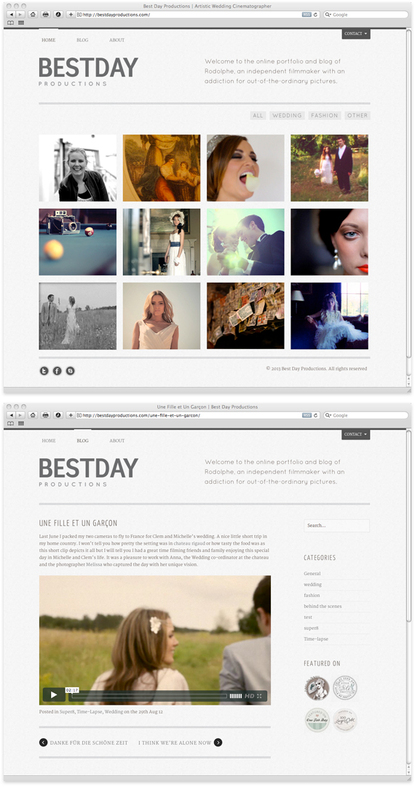 Rodolphe from Best Day Productions needed a new website to showcase his film and videography portfolio and to incorporate his blog. His new website is clean, modern and user-friendly. The design is based on a WordPress theme chosen by Rodolphe, which we heavily customised to display responsively on ipads, iphones and other devices.